ISLAMABAD: The Met Office Friday forecasted widespread rain/thunderstorm with snowfall over hills accompanied by windstorm in Quetta, Zhob, Kalat, Makran, Larkana, Shaheed Benazirabad divisions, Khyber Pakhtunkhwa, upper Punjab – Rawalpindi, Gujranwala, Sargodha divisions, Islamabad, Kashmir and Gilgit-Baltistan while at scattered places in Sibbi, Naseerabad, Sukkur, Hyderabad, Multan, DG Khan, Lahore, Faisalabad divisions, and at isolated places in Sahiwal, Bahawalpur and Karachi divisions during the next 24 hours. 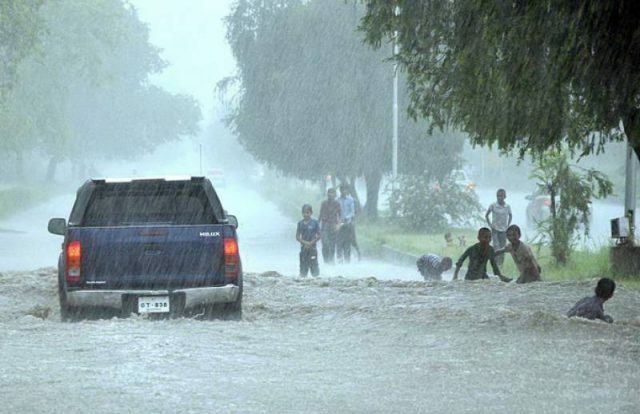 Heavy falls may cause flash flooding in local nullah/riverine of Balochistan and hill torrents of DG Khan and trigger landslides in Malakand, Hazara, Gilgit-Baltistan, and Kashmir during the period. According to the synoptic situation, a strong rain bearing system is affecting upper and western parts and likely to grip southern parts of the country today and may persist in upper parts till Sunday. During the last 24 hours, the weather remained cold and dry in most parts of the country. However, rain thunderstorm with snowfall over the hills occurred at isolated places in Malakand, Kohat, Bannu, DI Khan, Sargodha, DG Khan, Sukkur, Quetta, Kalat divisions. Following rainfalls were recorded in millimeters: Khyber Pakhtunkhwa: Bannu, D.I.Khan 11, Parachinar 06, Kalam 01, Upper Dir Trace, Punjab: Bhakkar 06, Noorpurthal, Layyah 01, Murree, Sargodha, Jhang, Trace, Balochistan: Khuzdar 04, Barkhan 01, Quetta (SM, PBO), Sibbi, Lasbella, Pasni, Gwadar, Zhob, Turbat Trace, Sindh: Jaccobabad 01, Snowfall (Inch): Kalam 0.5. The lowest minimum temperatures recorded were: Astore -11°C, Kalam -10°C, Gupis, Skardu -06°C, Parachinar, Malamjabba, Bagrote -05°C, Hunza -03°C, Drosh, Dir, Mirkhani -02°C, Islamabad 05°C, Lahore 09°C.